The capital of Madhya Pradesh, Bhopal is a fascinating amalgam of scenic beauty, a proud heritage and modern herbal planning. Bhopal today presents a multifaceted profile, the old city with its teeming market places and fine old mosques and palaces, still bears the aristocratic imprint of its former rulers, among them the succession of powerful Begums who ruled Bhopal from 1819 to 1926. Bhopal occupies the central region of the country and is concentrated more towards the northwestern portion of Madhya Pradesh. 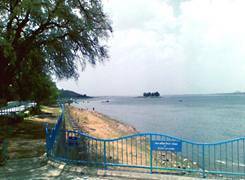 Bhopal is bordered with two large lakes which are commonly referred as the Upper and the Lower Lakes. 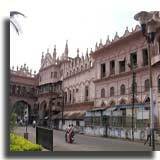 Bhopal comprises of the old and the New Bhopal where the former one occupies the northern part of the city and the new one is concentrated more towards the southern part. An Afghan soldier of fortune, Dost Mohammed 1708-1740, was the founder of the existing city, which is situated on the site of the 11th century city, Bhojapal, founded by legendary Raja Bhoja.It represents a harmonic symphony of the old and the new. History can never forget the contribution of Beguems, the females of the royal family who ruled the state for almost hundred years. They led austere lives, followed their religion faithfully and were able administrators. Begum Nawab Sultan Jahan was one of the prominent Begum rulers of Bhopal. One of the most important events and festival celebrated in Bhopal is Ijtima which takes place for three days in a place called Ghasipura.This festival is also accompanied by a fair where clothes and other accessories are sold. This is one of the major gatherings next to Hajj for the Muslim community where people from different parts of the world come here for the congregation. This is more of a spiritual festival. Other common festivals celebrated in Bhopal include Diwali, Ramnavami, Dussehra and Navratri with great enthusiasm and fun. During Dussehra Ram Lila, the traditional form of enacting some episodes from the Ramayana can be witnessed. 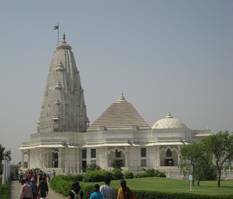 This beautiful temple on the Arera hills is also popularly referred as the Birla temple. The deity here is Lord Lakshmi and Narayana.This temple has a museum attached to it which houses sculptures from places like Raisen, Sehore and Mandsaur. MangalnathTemple-This temple is situated in the outskirts of the city and the local deity worshipped here is Mangalnath, especially on Tuesdays. Jama Masjid - Gold spikes crown the minarets of this beautiful mosque, built in 1837 by Kudsia Begum.Jama Masjid complex also contains a small pond. 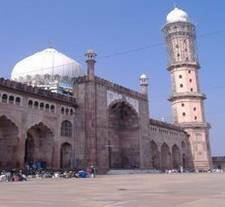 Moti Masjid - Architecturally akin to Delhi's Jama Masjid, this imposing mosque was built by Sikander Jehan, daughter of Khudsia Begum in 1860. This is said to be the largest mosque in the country, the building of this towering edifice was begun by Shahjehan Begum, but was incomplete on her death. broad facade, spacious courtyard and smooth marble floors. One of the most unique national institutes in India, Bharat Bhawan is a centre for the performing and visual arts. Designed by the renowned architect, Charles Correa, the contours of Bharat Bhawan merge in exquisite harmony with the landscape creating a visual impact of spacious and natural elegance. 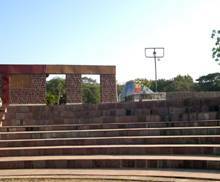 The Bharat Bhavan in Bhopal is located in the Shamla Hills. This is situated at the entrance of the Chowk area in the heart of the walled city.Shaukat Mahal is an architectural curiosity. Its mixture of styles in Occidental idioms sets it apart from the predominantly Islamic architecture of the area. This was designed by a Frenchman. This is situated behind Shaukat Mahal on the banks of the upper lake.Gohar Mahal is an architectural gem dating back to the times of Kudsia Begum, also known as Gohar Begum, who built this sprawling palace in 1820. The Mahal is a magnificent expression of the fusion of Hindu and Mughal architecture. This museum houses a fine collection of sculptures are on display here from various parts of Madhya Pradesh. Images of the Hindu deities such as Brahma, Vishnu, Shiva and the fine sculpture of the Khajuraho amorous couple are worth the mention. The museum remains closed on Monday. This is basically a science museum located on the picturesque Shamla Hills, Regional Science centre houses about 300 participatory exhibits distributed equally in inventions and fun science galleries and a taramandal planetarium. The museum remains closed on Mondays. 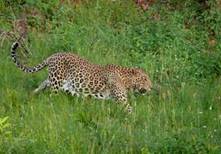 The safari park is located on a hill adjacent to the Upper Lake, with an area of 445 hectares. In these natural surroundings, wildlife watchers can view a variety of herbivorous and carnivorous species. The park remains closed on Tuesdays. The Upper lake is divided from the Lower by an over bridge and is six sq.km in area. 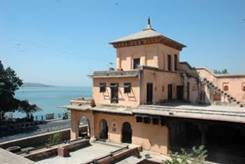 Raja Bhoj created the Upper Lake in Bhopal in the 11th century while the construction of an earthen dam across the Kolans River. The Madhya Pradesh Tourism's Boat Club on the Upper lake provides facilities for exciting trips by sail, paddle and motorboats. This aquarium is situated facing the lower lake. This fish shaped aquarium houses a number of fascinating species of fish in all shapes and sizes. Mrignayani Emporium and Handicrafts Emporium - souvenirs and local handicrafts. Women's Co-op Zari Centre, Pir Gate - bags with some exquisite zari work and rich embroidery done with gold and silver thread and chiffon sarees. MP State Emporium, GTB Complex, TT Nagar - chanderi saris and fabrics as well as tussar and other raw silks. 3.Jehan Numa Palace Hotel Pvt.Ltd. There are regular flight services connecting Bhopal with Delhi, Indore and Mumbai. International flights, operated by Air India, are available for reaching from places like Sharjah and Dubai. Bhopal is on the Delhi-Chennai main line. Major trains going from Mumbai to Delhi via Itarsi and Jhansi also go through Bhopal. It is also the terminus of the Shatabdi Express, which daily shuttles between Delhi and Bhopal. Regular bus services connect Bhopal with Indore(185 km),Mandu(285 km),Ujjan(188 km) and Khajuraho(383 km).Interstate bus services are also available, which makes commuting to distant places from Bhopal possible by road.